The Perrin Field Honor Guard Corp is a Boy Scout group that was established in 2006 by Shannon Thomas. The unit provides patriotic and ceremonial services, to communities and Service Veterans of the United States. Since August, 2006 the unit has participated in 50+ events, never charging fees to cover expenses incurred while planning and preparing for an event. Their mission is to represent the Boy Scouts of America by providing Honor Guard style flag presentation’s at civic functions, parades and military ceremonies. They have strove to maintain precision, professionalism and pride, while demonstrating the highest level of commitment to our country and community. 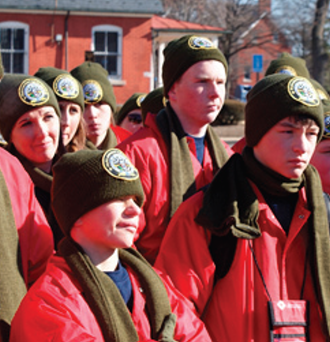 On January 16th, 2009 a team of 24 Boy Scouts and 10 Scout Leaders traveled to Washington D.C. representing the Texoma Valley District, and Circle Ten Council of North Texas, during the week of the Presidential Inauguration festivities. The boys began raising funds to cover the trip expenses last summer. The trip and Honor Guard team is sponsored by Boy Scout Troop 911, Charted to the Woodmen of the World Lodge 11, Denison. The team is supported by 10 different local scout units and 5 school districts. Troop 911, Troop 55, Troop 605, Troop 611,Troop 9, Troop 15, Troop 38, Troop 216, Pack 61, and Troop 39. Representing Troop 11: Elijah Thomas, Rowdy Farmer, Elijah Reynolds, Jake Walters, Tyler Bunch, Jayton Hawkins. Wade Walters, Dylan Shaw; Troop 55: Aaron Russell, Dalton Day, Drex, Preston Lawrence; Troop 611: Kaleb Cockrill, Danny Emory; Troop 39: Alex Strozensky, Eric Strozensky; Troop 15: Cahl Miller; Troop 16: Zachary Hinton; Troop 9: Blake Stephens; Pack 61: Jackson Young; Troop 605: Logan Manning, Brady Manning, Collin Spindle; Troop 38: Caleb Reed. The boys in this Honor Guard unit participated in many fund raising events from the traditional boy scout popcorn sales, to carwashes, school dances, cookie sales, calendar sales, local benefit concerts, and many donations from organizations that include, Local and State Woodmen of the World Lodges, VFW’S, AMVET’S, American Legion’s, Grayson County Vietnam Veteran’s Association, Grayson County DAV, Independent order of Odd Fellows, many local business, civic organizations, churches, citizens, and family members of the boys and leaders.